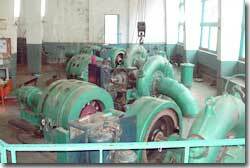 Panauti Hydropower Station is the third hydropower station constructed in Nepal. It is a run-of-river scheme on Roshi Khola (river) having installed capacity of 2.4 MW with 3 units of 0.8 MW each. This power station lies at Khopasi of Kavre district located 35 km east of Kathmandu. The power station was commissioned in the year 1965 A.D. with designed annual generation of 6.97 GWh. The project was completed with the assistance from USSR Government.